It is with great pride and a deep sense of responsibility in front of the Canadian proletariat and the international communist movement that we announce the rallying of the Social Revolution Party (SRP) to the Parti communiste révolutionnaire - Revolutionary Communist Party (Canada). The Social Revolution Party is an Ottawa-based communist group founded in 2009. Created two years earlier, the Revolutionary Communist Party is a Marxist-Leninist-Maoist party that fights for a revolutionary change in Canada, for workers power and socialism, as part of the world revolution. 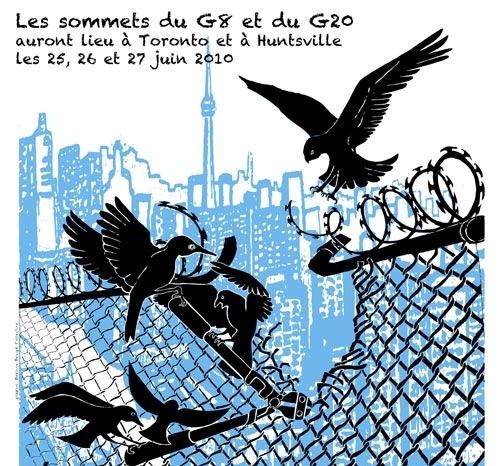 Following the historic anti-capitalist mobilization against the G20 Summit in June 2010 in Toronto, the Social Revolution Party came into contact with the RCP. During the fall, members of the SRP studied and discussed the program of the RCP. The comrades of the SRP also took part in the Second Canadian Revolutionary Congress organized by the RCP, which was held December 11, 2011 in Toronto. The RCP was then able see the quality of the revolutionary commitment of the SRP and its activists and their willingness to move forward on the path of communism and revolution. Despite being a young organization, members of the SRP already have a rich experience in organizing, especially among the working class. The SRP has published a compelling and sharp criticism of bourgeois parliamentarism, consistent with the Marxist critique of the state and of bourgeois democracy. Through the concept of “Popular Action Movement” they popularized, the SRP also made a positive contribution to the debate on the need to fight right now to create the backbone of a new popular power—the one that will replace the old power structure currently in place after the destruction of the bourgeois state. This concept especially makes sense through the strategy of protracted people’s war, which is specifically aimed at mobilizing the masses in the struggle to conquer power. After this period of exchange and discussions, the Social Revolution Party has unanimously decided to constitute itself as a cell of the RCP. Canada’s revolutionary forces, young and old, have entered a period of renewal, regrouping, and reconstitution. Principled unity and struggle, based on Marxism-Leninism-Maoism, the need to break with bourgeois legality and the state, to ally with Aboriginal Peoples, and to wage People’s War, can build a movement from coast to coast. The Social Revolution Party, which aimed to bring attention to the need for a true social revolution to abolish the exploitation of working and oppressed peoples, eagerly welcomes the buildup of revolutionary forces and mass movements across eastern Canada, and hopes that 2011, the year of another meaningless election, will herald even greater returns for the communist movement. Upholding Marxism-Leninism-Maoism and especially applying it to the concrete conditions of Canada; strengthening a leading center capable of bringing together all forces willing to fight for communism and revolution; deploying a unified Communist agitprop across the country: These are factors which all portend important victories for the proletariat and the popular masses. Long live unity among communist revolutionaries! Towards on the revolutionary path! Everywhere in Canada, let’s build the RCP!